Texans have a saying: "It's not if there will be bad weather but when." This mobile app helps city workers maintain trees. A Texas storm can create havoc by downing trees that cause power outages, block escape routes, and damage property. But city managers in the state are making their cities storm ready by using GIS to identify trees that need to be trimmed or have fallen prior to a storm. State forest agency Texas A&M Forest Service (TFS), with help from Esri partner Timmons Group, developed a GIS urban tree risk assessment mobile app using Esri ArcGIS. It's available for download from a GIS portal at TFS. City workers use the Level One Tree Risk Assessment Mobile Application on their mobile devices to inspect trees, geocode tree information, and transfer information to an urban tree inventory database. Using the application for what's called a level-one assessment, staff visually inspect individual or populations of trees near roadways and utility rights-of-way. 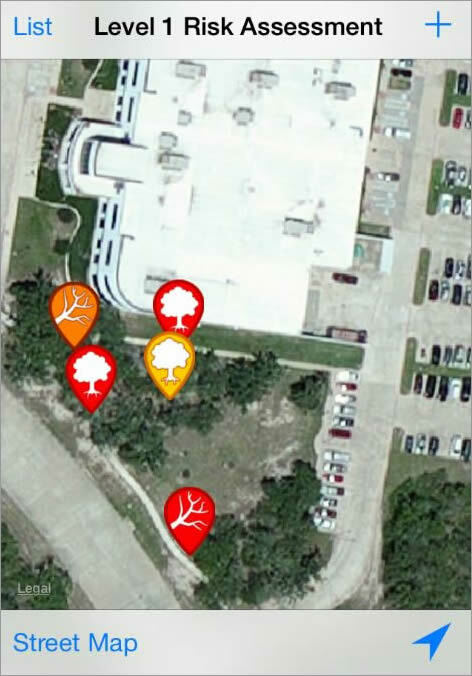 By using GIS to map a level-one assessment, the department manager can decide how to prioritize and schedule tree maintenance. The app has simple navigation tools, includes the ability to toggle between aerial and street maps, and can zoom to a location based on GPS. The user can also take GPS-linked photos. The workers can capture information such as the latitude/longitude, species, and condition of a tree including the branches. Through network connections, the app transfers information from the user's phone or tablet to the city's GIS. "The Level 1 Tree Risk Assessment Mobile Application helps resource managers quickly recognize trees having an imminent or probable likelihood of failure," said Gretchen Riley, partnership coordinator for TFS. "It ensures the safety of residents and speeds disaster response time. Ultimately, the app makes tree management more efficient, thereby saving the community money." TFS helps communities design sustainable urban forestry programs. One way it does this is by creating GIS web apps that urban forest managers throughout the state can use to better understand and manage their forests, be more efficient, and improve the accuracy of their forest data. TFS uses Esri ArcGIS to analyze the state's tree and forest lands data. The agency's GIS portal, at texasforestinfo.com, is a public-facing website that utilizes ArcGIS for Server and offers a variety of maps about forest conditions. Urban forest managers use the site to help develop and implement components of their urban forestry management plan. TFS produces mobile apps such as the Level 1 Tree Risk Assessment Mobile Application to make implementing its plans easier. Timmons Group used ArcGIS Online to configure the Level 1 Tree Risk Assessment Mobile Application. City workers use the downloadable app to capture specific tree information such as latitude/longitude, species, tree condition, branch conditions, and so forth. The app has simple navigation tools, the ability to toggle between aerial and street map, and can zoom to a location based on GPS. The user can also take GPS linked photos. Through network connections, the app transfers information from the user's phone or tablet to the city's GIS. The app also supports offline mapping tasks and stores data locally, which is particularly handy after a storm because of the possibility of broken connectivity. 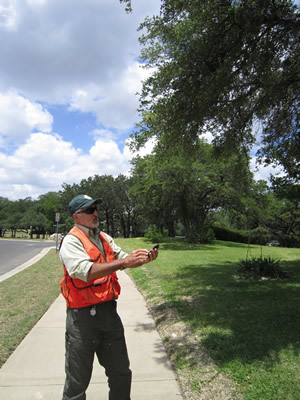 Urban regional forester Oscar Mestas uses a Texas A&M Forest Service app to capture city tree data in Austin, Texas. The information can be e-mailed to the office computer, and the tree can be added to the city's maintenance schedule. City maintenance personnel routinely use the mobile app to report dead and dying trees while going about their everyday tasks. Following storm events, such as high winds or heavy rains, staff can identify those trees that need to be removed or pruned to increase safety and allow emergency vehicles to pass along roadways. The mobile application is also useful in city tree maintenance programs. For instance, the city may have a scheduled five-year pruning cycle. However, weather such as drought or storms can affect individual trees and require action to mitigate risk outside of the scheduled pruning cycle. The application can be used by high-and low-end users. On the high end are Texas's larger cities, such as Austin, that have very advanced GIS departments. If they have an ArcGIS Online account, they can incorporate the data captured with this tool into their GIS and workflows. On the low end are communities with tree maintenance departments that are essentially one-man shops, which may not have GIS capabilities. In these instances, tree managers use the mobile application to capture tree data. Then they click the Use Local Data button to e-mail a text file that can be used on an office computer. Managers can simply store and update tree data on their mobile devices. "Putting GIS tools into the hands of resource managers has extended our reach tenfold," Riley said. A grant from the US Forest Service Urban and Community Forestry program helped fund development of the Level 1 Tree Risk Assessment Mobile Application. The TFS site, TexasForestInfo.com, offers nine applications to help foresters explore forest potential and improve management. For instance, the Forest Distribution application shows various tree types throughout the state. The Forest Ecosystem Values application provides estimated economic values for ecosystem services and benefits. The Tree Trails application allows users to create real and virtual arboreta. No matter their location, users can access conservation education information. TFS is currently developing a new urban tree canopy application called Canopy to Change. TFS applied the US Forest Service Forests on the Edge model to its urban forest analysis. Originally, the model was designed to identify areas where private and national forest services were affected by factors such as development, insect pests, fire, and disease. TFS adapted the model to help predict urban growth areas across the state. Resource managers will use the application to access existing tree canopy data and overlay it on geographic areas that are predicted to see a dramatic increase in population in the next decade. Seeing these relationships on a map will help managers identify canopy at risk of loss from development. The app also reveals areas where trees can be grown to benefit future generations. This information better equips decision makers to intelligently design resilient communities and forests. For more information about Timmons Group's geospatial products and services, contact Lowell Ballard or visit timmonsgis.com. Read more about Texas A&M Forest Service.